Classic Rhythm is a unique and exciting chamber group with a difference. 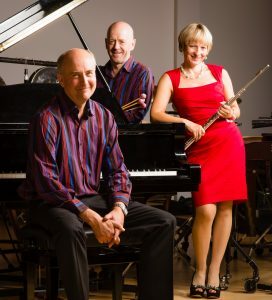 Formed in 1992, this trio for flute, piano and percussion has met with astonishing success, playing to sell-out audiences all over the UK as well as broadcasting on Classic FM and being featured on BBC2. Classic Rhythm has appeared at several hundred festivals, music societies and other arts venues, encompassing literally every region of the UK. Engagements have included many return visits to Scotland and Ireland, appearances at major venues such as London’s South Bank and the Welsh Proms and, by popular request, a series of concerts in The Midlands for three years running. Skilful arrangements of well-known classical favourites, set alongside an exceptionally wide variety of other pieces, have quickly established the group’s popular appeal. The range of music, from original compositions to light and jazz arrangements, is complemented by the warm informality of the group on stage. Audiences are always fascinated by the vast array of instruments, some familiar, some not! From marimba to tam-tam, from piccolo to cabasa, they are brilliantly woven into a sparkling evening’s entertainment. The group combines the talents of Helen O’Connell (flute, piccolo and recorders), Adrian Sutcliffe (piano and keyboards) and Chris Brannick (percussion – tuned and untuned), all of whom studied at the Royal Academy of Music and were prizewinners in their various fields. All three are widely travelled musicians – between them they have performed at all the major concert venues in the U.K., as well as travelling further afield to Africa, the Far East, the U.S.A. and all parts of Europe. Helen studied flute and recorder at the Royal Academy of Music, where she gained the Recital Diploma, together with many prizes for solo playing, ensemble work and baroque performance. As a professional flautist she has played in most of the country’s top venues, in West End shows and has featured on both Classic FM and BBC Radio. Alongside performing she has enjoyed many years of teaching. One of her current posts specialises in teaching blind and visually impaired students. Adrian’s work has ranged from solo performances in Eastern Europe and New Zealand to frequent performances at the Royal Opera House and West End Shows, whilst his compositions and arrangements have been featured on Classic FM, BBC television and at Sadler’s Wells. As an examiner and trainer for A.B.R.S.M. he has travelled from Africa to the Middle and far east to the U.S.A., India and China. Chris is an adventurous performer with a taste for the eclectic. He is a founder member of the leading contemporary percussion group ensemblebash, performs in cabaret with his show The Brannick Academy, and he acts, composes and arranges. He holds both maths and music degrees, is a professor of percussion and until recently was CEO of the Newham Music Trust, an educational charity.